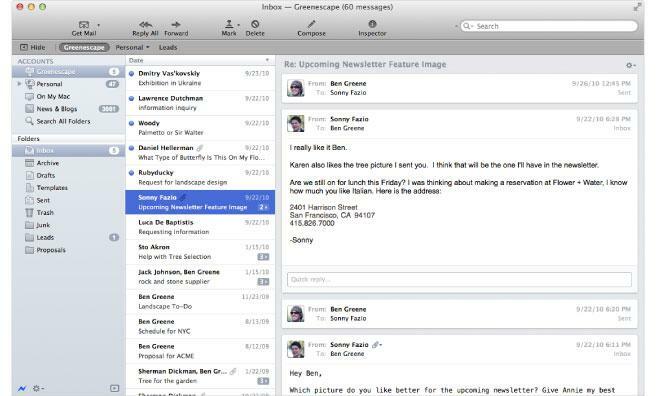 For new Mac owners who feel OS X's built-in mail client is too complicated for their needs or who find it doesn't play nicely with their email provider, AppleInsider went hands-on to find the top alternatives. Email clients have a long history as utilitarian bits of software; the category is not a particularly alluring one, and as a result it has traditionally seen relatively little innovation. That has begun to change as email proves more difficult to replace than some believed, and the focus has shifted toward adapting the decades-old technology for the future. For this roundup, AppleInsider spent five days with each client, using them as our exclusive gateway to email on our desktop during that time. Each one was asked to handle three accounts— one personal Google Apps account, one AppleInsider Gmail account, and one cPanel-based IMAP account with 20,000 test messages in its inbox. Unibox, from German developers eightloops, is a speedy IMAP-only client with a slick and well-thought-out user interface that is perhaps the most Apple-like we've seen. After feeding Unibox the name, email address, and password associated with each account, our mail server settings were automatically detected and the accounts configured without any further intervention on our part, though it does offer the option to set server parameters manually. Importing messages went smoothly, with Unibox showing no sign of stress even with more than 35,000 emails in our combined inboxes. By default, Unibox shows users a split-pane view with contacts on the left and their associated messages on the right. There is no master list of conversations here— messages are organized by contact, a departure from the traditional email paradigm but one that we grew to enjoy after an admittedly rocky acclimation period. Unibox's slick interface and contact-centric design make it the best client we tried. The contact list is reshuffled based on the date of your last communication with that person, beginning with the most recent. Clicking on a contact displays your entire conversation history in chronological order, and individual messages can be moved, replied to, or deleted from the thread with controls that are hidden until you begin to move your mouse pointer in their direction, a feature that helps keep the user interface uncluttered. Attachments are shown alongside the message that they came with, but Unibox also provides a separate view that collects and displays all attachments exchanged with that contact. We found this, combined with OS X's QuickLook, to be an extremely useful feature that we would like to see other clients adopt. There are some features we missed during our review— for instance, we occasionally wished for something akin to Apple's Smart Folders, and we would like a more robust method for dealing with conversations with more than one recipient. 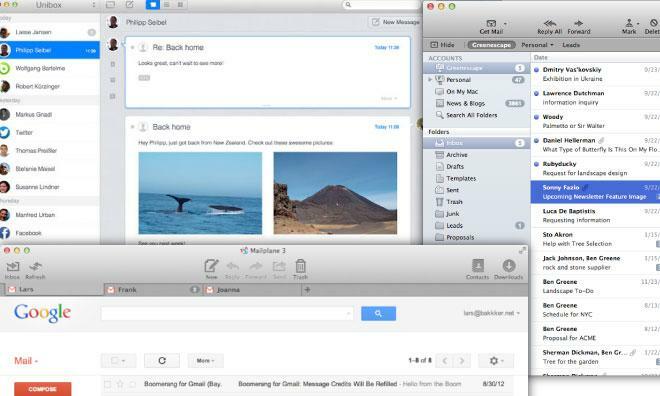 Overall, however, we found Unibox to be a breath of fresh air and a mail client that we can heartily recommend. Unibox is available now for $9.99 on the Mac App Store. For those who live and die with Gmail's web interface but want a more deeply integrated OS X experience than a web browser can provide, Mailplane is far and away the best option. Configuring accounts is painless, and Mailplane handles Google's two-factor authentication easily without requiring users to create an application-specific password. Mailplane's ability to simultaneously access any number of Gmail accounts at once is a godsend for those— like most AppleInsider editors— who use Google's email service for both personal and professional reasons. Mailplane's easy-to-understand user interface consists of a row of "action buttons" for functions like refreshing the inbox, creating and replying to messages, and accessing the Safari-like downloads manager, which keeps track of downloaded attachments. Below that are tabbed browser windows for each account— switching between accounts is trivial, unlike Google's wonky web implementation. Mailplane will win over Gmail diehards with its multi-account support alone. Because Mailplane acts as a wrapper around Gmail's standard interface, users can avail themselves of Gmail's already impressive array of keyboard shortcuts or define new, customized shortcuts in the client's preferences. Drag-and-drop and QuickLook are both available for dealing with attachments, and like Mail.app, Mailplane will handily offer to resize attached images when composing a new message. Mailplane provides the option to hide Gmail's advertisements as well as the widgets for Google Chat and Google+. In addition, Mailplane offers Notification Center integration for new mail and a menubar widget that shows the most recent mail for each account and allows users to temporarily silence notifications with a "Do not Disturb" mode, which we found useful when looking for periods of uninterrupted concentration. The $24.95 price tag may seem steep compared to some of this roundup's other options, especially in light of Mailplane's online-only nature, but Gmail power users will find it money well spent. Mailplane is not available on the Mac App Store but can be purchased directly from its developers at www.mailplaneapp.com. A 15-day free trial is available. Postbox is not unlike a souped-up sleeper variant of Apple Mail: the facade is familiar, but a closer inspection reveals a powerful, feature-packed email client. Longtime Apple Mail users will feel right at home in Postbox, as nearly every standard interaction— from adding accounts to searching to its threaded conversation view— recalls Apple's workflow. Where Postbox shines, however, is in extending those functions with small additions that make them faster or easier. 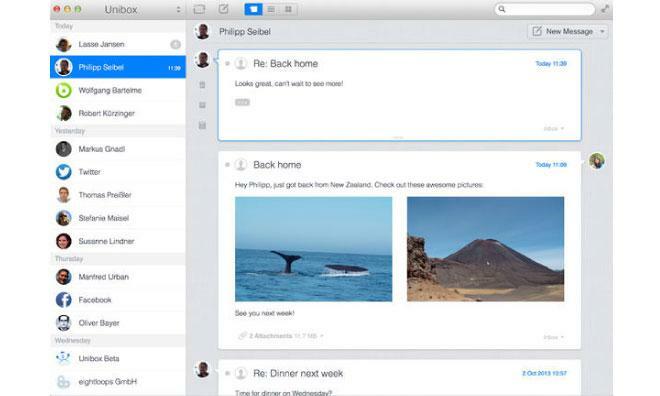 Postbox features heavy social integration, similar to Xobni's addon for Microsoft's Outlook. After signing in to Facebook, LinkedIn, Twitter, or Dropbox, Postbox will pull photos for contacts, provide one-click access to their social profiles, and display metadata like employment information from LinkedIn in the app's "Inspector pane." We found Postbox's Dropbox integration particularly useful when sharing large attachments, as we could simply embed links to the files in Dropbox. Postbox is like a souped-up version of Apple Mail for power users. One of our favorite Postbox additions, the Inspector pane is also home to a function similar to Apple Mail's Data Detectors. Where Apple Mail recognizes strings like dates and tracking numbers within messages, Postbox identifies and collates them in the sidebar along with links, images, attachments, and the aforementioned social data. Enabling the Inspector does consume valuable horizontal screen space, but a keyboard shortcut is provided to quickly show and hide it. We also became attached to Postbox's quick reply feature, which appends a small reply form at the end of each message. Quick reply is a lifesaver when working through large batches of emails at, for instance, the end of a long international flight. On our testing machine, a Core i7- and SSD-equipped 15-inch MacBook Pro, searching through large mailboxes was fast, but Postbox was not particularly efficient: we often found it taxing our CPU and were forced to restart the app more than once. We also found Postbox's tabbed interface for mailboxes and messages difficult to use, and sometimes opened new tabs unintentionally. In our opinion, Postbox's strengths far outweigh its weaknesses, and it makes for a fine upgrade from Apple Mail for power users who want to work with their email locally. 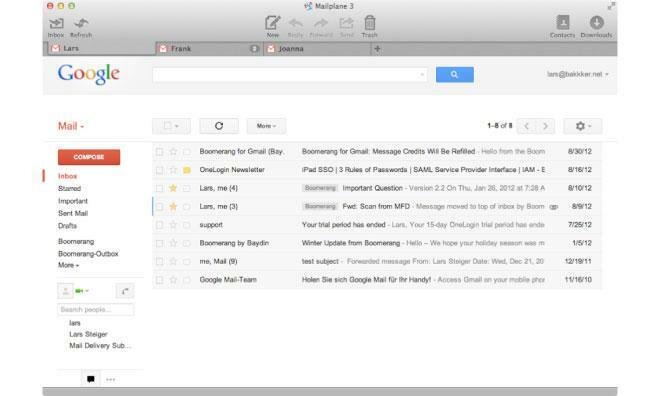 Postbox is not available on the Mac App Store, but is a $9.95 purchase from its developers at www.postbox-inc.com. A 30-day free trial is available. Mozilla Thunderbird - Thunderbird is one of the oldest still-maintained mail clients around, and it has begun to show its age. In our testing, it was much slower than its competition and the user interface is in desperate need of an overhaul. Other than its extensive add-on ecosystem, there is little reason for most users to choose Thunderbird over Apple Mail. Thunderbird is a free download from Mozilla. Outlook for Mac - For users in corporate Microsoft Exchange environments, Outlook for Mac has traditionally been the option that provides the fewest headaches. Though we haven't had a chance to test Outlook 2011 ourselves, corporate IT administrators who support Macs on their networks confirmed that Outlook remained the preferred choice when asked. Outlook is included as part of Microsoft Office for Mac. MailMate - MailMate is a robust, no frills mail client that is unabashedly designed for power users. MailMate features expansive keyboard shortcut support and a bevy of customization options, though its spartan user interface is often difficult to navigate. It handled our large mailboxes with aplomb, and its granular search functionality is second to none. MailMate can be purchased for $49.99 directly from its developer at www.freron.com, and a 30-day trial is available.